Hearts first-team regulars are again well represented in Scotland Under-21s coach Ricky Sbragia's latest squad. Sbragia's team face France and Group 3 leaders Iceland next month, having beaten Northern Ireland in September. 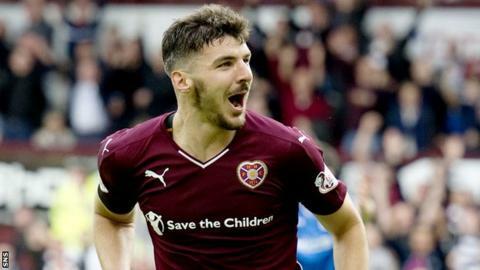 Tynecastle defenders Jordan McGhee and Callum Paterson and their club-mates Billy King and Sam Nicholson are in the squad. And Hearts reserve goalkeeper Jack Hamilton is also selected with uncapped Ryan Fulton also included again. The five Hearts players and Liverpool's Fulton were in Sbragia's last squad. Dundee United midfield duo John Souttar and Charlie Telfer are included along and Ryan Christie, who is being loaned back to Inverness Caledonian Thistle after signing for Celtic, is among the forwards. Ryan Fraser, on loan at Ipswich Town from Bournemouth, and Sporting Lisbon's Ryan Gauld also have places, along with Hibernian's top scorer Jason Cummings. Scotland meet France on 10 October and Iceland three days later, with both matches taking place at Aberdeen's Pittodrie Stadium.